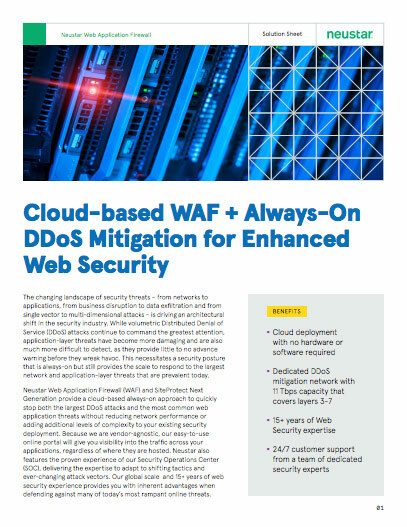 Neustar Web Application Firewall (WAF) and SiteProtect Next Generation provide a true cloud-based Always-On approach to quickly stop the largest DDoS and most sophisticated web application threats without reducing network performance or adding additional levels of complexity to your existing security strategies. Because we are vendor agnostic, our easy-to-use online portal will give you visibility into the latest threats across all of your applications – regardless of where they are hosted, along with the expertise to adapt to shifting tactics and ever changing attack vectors. Our global scale and 15+ years of web security experience provide you inherent advantages when defending against many of today’s most rampant online threats. Cloud, Hardware & CDN Agnostic – cloud-provider, hardware and CDN agnostic, Neustar WAF is compatible anywhere your applications are hosted, so you can reduce costs and consistently configure rules anywhere, without any restrictions. Layered Protection – integrated with Neustar Always-On DDoS mitigation service, gives you a comprehensive, layered protection stack that quickly prevents bot-based volumetric attacks as well as threats that target the application layer, such as SQL, XSS, CSRF, Session Hijacking, data exfiltration and zero-day vulnerabilities. Integrated Intelligence - receive custom rule configurations and white/ black list recommendations, from a team of security experts, on industry best practices to protect your most critical applications from security flaws and overlooked misconfigurations. PCI DSS Compliance - certified by the PCI Security Standards Council, giving you peace of mind from liabilities and penalties, along with alleviating your in-house resources from PCI required manual reviews and hardware deployments. Seamless Management - easy-to-use online portal lets you seamlessly manage all of your web security needs from one place, regardless of where your applications are hosted. You can make configuration changes instantly, and reporting/logging capabilities allow you to analyze the effectiveness of your website and application security. Trusted Experience - our team of dedicated security experts monitor and update our WAF technology to protect against emerging threats and have 15+ years of experience in web and application security.